Outdoor Dance Floors are great for summer events, specifically a great rental item for outdoor weddings! 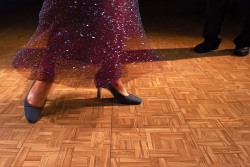 The largest size of the Teak Dance Floor with sub-floor is the 15 x 15. Dance floors that are being set up on soft or bumpy surfaces will include the sub-flooring (which is 16 x 16) that is set up under the dance floor. Sub-floor is required when the dance floor is set up on the following surfaces: Grass, Gravel, Dirt, and Indoor Padded Carpet. More Information: The flooring must be set up on a flat surface. The Sub-floor does not make the floor flat enough to set up on a non-level surface.